JOHNNY GUITAR THE MUSICAL is based on the infamous Nicholas Ray film by the same name, which celebrates its 50th Anniversary this year. The film was originally released in 1954 starring Joan Crawford, Sterling Hayden and Mercedes McCambridge and has become a phenomenon with fans and adoring cinemaphiles worldwide. JOHNNY GUITAR takes this same epic tale of love and jealousy that embraces western conventions with an unusual sense of paradox and a strong sense of humor, heightens these elements just a notch and adds a rousing melodic score that echoes the steamy ballads and doo-wap hits of the 1950’s. The musical is set in a small town in the New Mexico mountains circa 1885. The story centers on Vienna, a sultry saloonkeeper who built a booming business on her back. Though Vienna is the ultimate ‘bad girl gone good,’ her nemesis, the pent-up Emma, sees things differently. A domineering cattle baroness, Emma controls the town with an iron fist but loses her grip when she falls for the dangerously hot-headed Dancin’ Kid. 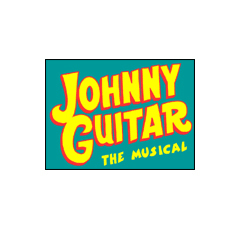 By the time Johnny Guitar, a tall manly stranger with a secret past rides into town, the stage is set for an epic showdown, unlike anything the Old West or Off-Broadway has ever seen.